Famous 35 squadron flew 12 Lancaster heavy bombers in tight formation over the saluting base yesterday. I was with them in the bomb aimer’s position of a machine in the rear line of the “V”. We hit the fringes of the City and a heavy rainstorm at the same time. Powering through the flat panel in the nose of the machine I picked out through the low clouds St Paul’s, then Trafalgar Square, the Mall then Buckingham Palace – all thronged with people. And then they had gone. It was as quick as that. Four WAAFs flew with this pioneer Pathfinder Squadron. There was one vacancy for two watchkeepers with long service. The two girls were Sergt Edna Coats, aged 28 of Torquay and her friend Sergt Sally Speer. Lancasters of no. 35 Squadron which roared over in the Victory fly-past yesterday will soon be seen by thousands of American people. 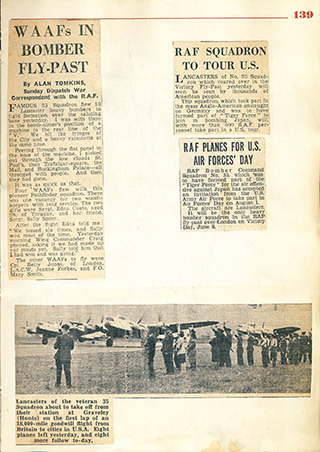 This Squadron, which took part in the mass Anglo-American onslaught on Germany and was to have formed part of Tiger Force to join in bombing Japan will, with more than 400 RAF personnel take part in a US tour. RAF Bomber Command Squadron no. 35, which was to have formed part of the Tiger Force for the air offensive against Japan has accepted an invitation from the US Army Air Force to take part in Air Forces’ Day on August 1. The aircraft are Lancasters. 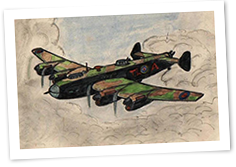 It will be the only heavy bomber squadron in the RAF fly past over London on Victory Day, June 8. Lancasters of the veteran 35 Squadron about to take off from their station at Graveley (Hunts) on the first lap of an 18,000 mile goodwill flight from Britain to cities in the USA. Eight planes left yesterday and eight more follow today.